Name too long, I couldn’t think of anything better to describe this recipe :-). Have a better idea then just leave it in the comments. Mind you it is a kid friendly website :-). 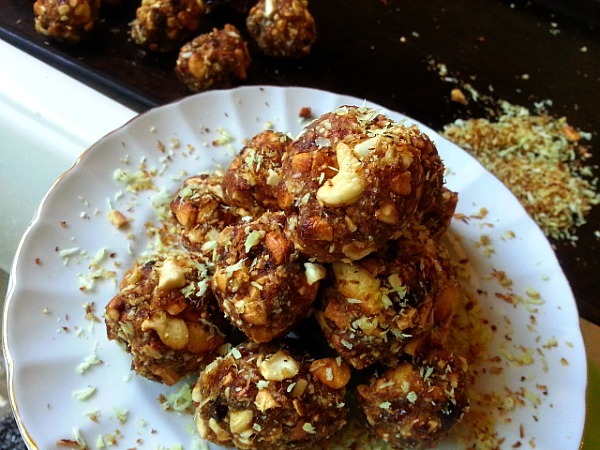 I must confess, before I made these aromatic toasted coconut cashew date laddoos I just wasn’t a big fan of dates. I started to eat them because of my diet that called for eliminating processed sugars with more natural forms. A word of caution it does have approx 8-9 grams of sugar per date, so keep a watchful eye. I just love to eat something sweet after a meal. I found ripe dates are mushy and work as a great binder. Also you have to toast the coconut as fresh grated coconut goes bad specially if it is hot. Laddoo( in hindi) is a word used for sweets that are round in shape. My first try of these aromatic goodness was with just cashews. On my second try I decided to add a Goan influence of coconut and cardamom. Fyi Indians use cardamom to flavor the desserts, while cinnamon is more popular in the US. • In a non stick pan add grated coconut and on medium low heat toast the coconut till light golden brown. • In a mixing bowl, first de-seed the dates and smash it with a fork or use your fingers. • Roughly chop the cashews and add it to the mixing bowl. • Next add the toasted coconut, crushed cardamom and mix it well with your hands. It should have a dough ball consistency. • Divide into equal portions depending on the size of date balls you want. • Shape each portion to a smooth ball. Store in an airtight container in a cool dry place. Enjoy it as a healthy snack or with a nice cup of tea. Its is vegetarian and vegan friendly. Previous Previous post: Low Carb Chai Tea, Goan Style! Thank You so much JerriAubry, appreciate the reblog :-). Sounds soooo good =) And it’s vegan too! yey! Definitely gonna try this! Yes it is, my husband and I really enjoyed them after our meals 🙂 and it sure is vegan. I was just wondering, how long have you been blogging? I made them and they were delicious!!!! I’ve never used cardamom. It is sooo good. I wrote a family cookbook, so I know how wonderful is the feeling when someone shares the enthusiasm of something you, too, think is wonderful!!! That is true Debbie :-). You have a great nite! I’m making these today!! I can’t wait. yahoo!! Due to an unexpected doctor’s appointment, I didn’t get to make them, YET!! I’m making them tonight!!! I’ll let you know!! I LOVE them!! !Thanks so much! We had friends over, she makes date balls all the time.. she told she liked these better. I think it was the toast3ed cashews and cardamom. Anyway, they were delish! Wonderful recipe from a new friend, Nandini. 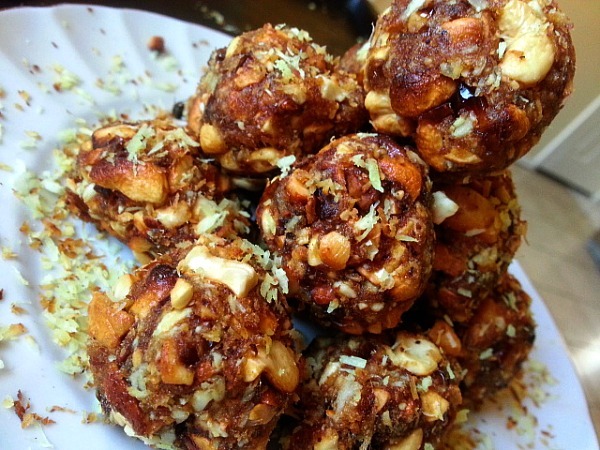 Yum, yum, yum Nandini, love this… and I love the fact that they are a version of ladoos. 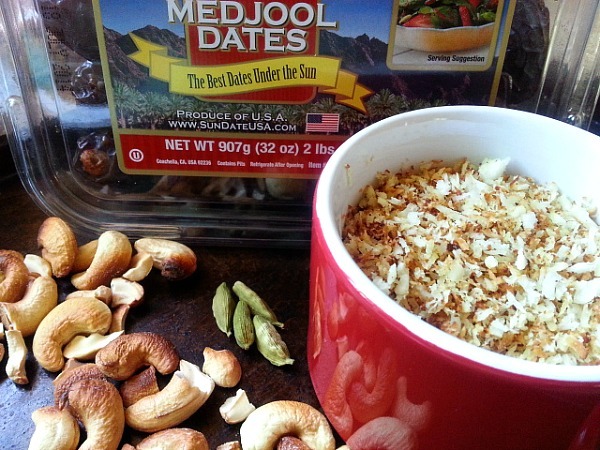 Dates and cashews?? What’s not to love there. I’m going to try them ASAP, like you say, it’s a healthier version of something sweet after dinner. Great job! Oh my! this is mouthwatering.. These laddoos have all my favorite ingredients. I will definitely make them! I cannot wait to try these due-dates!! They remind me of my aunt. She always made a powdered sugar rolled date loaf at Christmas! thanks for taking the time to read and “like” “Someone Hear, someone Listen”. Thank You Debbie :-). I hope you do give this recipe a try. They taste really good. Ooh – these look incredible! I kind of scoffed at dates back in the day, but now I find they perfectly satisfy the bite of sweet I crave after a meal. Back in the 70’s my grandma used to make these no bake Date Bars using Rice Crispies and coconut, this reminds of them! Aww… Lorraine that is such a sweet memory 🙂 I wasn’t very fortunate to meet my grandparents on either of my parents side and I think its a priceless experience that we can ever have. I am happy my kids have this opportunity. Sounds delicious! These ingredients are always in my kitchen.so I’m going to make it! Oh my rich and delectable Ladoos Nandini. ..